Sandstone beds of Chumstick Formation cut by basalt dikes. Looking north across upper Devils Canyon. 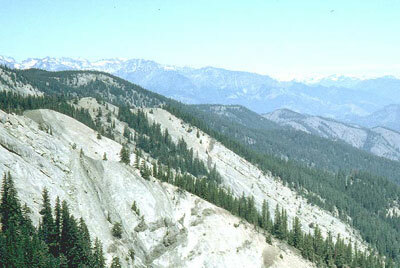 Most hills in the middle ground are within the Chiwaukum "graben". High peaks on the left are carved from the Mount Stuart batholith and rocks of the Ingalls Tectonic Complex. Distant high peaks on the right are carved from metamorphic rocks of the Northern Entiat Mountains. The rocks and deposits within the Wenatchee quadrangle can be grouped into six generalized units: (1) Precambrian(?) Swakane Biotite Gneiss in the northeastern part of the quadrangle and the probable Jurassic low-grade metamorphic suite, mostly composed of the Easton Schist, in the southwestern part; (2) the Mesozoic Ingalls Tectonic Complex; (3) the Mesozoic Mount Stuart batholith; (4) lower and middle Tertiary nonmarine sedimentary and volcanic rocks; (5) Miocene basalt flows and interbedded epiclastic rocks constituting part of the Columbia River Basalt Group and interbedded silicic volcaniclastic rocks of the Ellensburg Formation; and (6) Pliocene to Holocene alluvium, glacial, flood, and mass-wastage deposits.